The antique Scandinavian bench gets a new look with our collection of zig zag pillows that just seems to bring a smile to your face! Throw in a fuzzy white+ some polka dots and Voila! Ajax seems to approve. While giving the showroom a little pick me up for the summer’s end, our friend and favorite fabric rep, Sheryl stopped by for updates, new product and always some great chat! 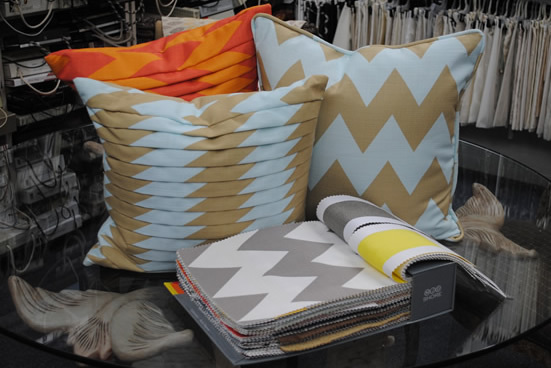 We chose one of her new collection of fabrics for pillows because they’re fun with bold color combinations and great patterns. The “Charlie Brown” zig zag pattern creates an entirely different look when we constructed it as a multiple flanged pillow. I just love it! 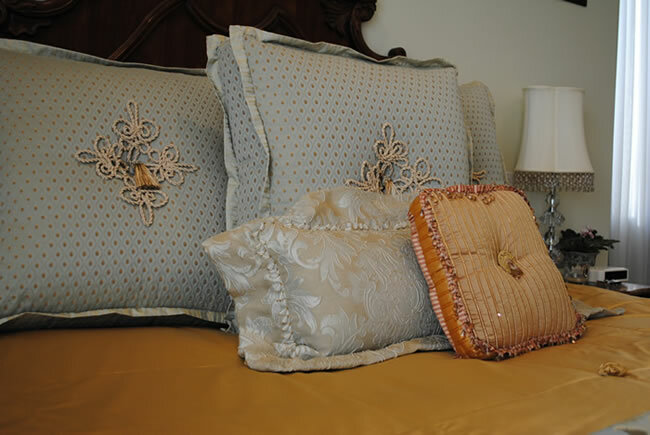 Pillows are a great way to give a room a lift with a new look and the easiest design solution without breaking the bank! I’m jumping into the blogging arena under my moniker “Insidelady” which I originally coined in the early 70’s when it was my CB handle where clever self-proclaimed descriptions were the rage of the time. Fast forward 30+ years (oh my, I’m telling my age! ), and it has sorta stuck with me as did my passion for all things interior design. However, the only difference now is I frequently get deleted as questionable internet solicitations for the oldest profession on earth! So I’m going to keep the name and see if the blogging craze lasts longer than the CB phase! I manufacture for a trade that seems to change and evolve daily. Trends and the designers setting them rise and grab all of our attentions as they create their art work. I try to learn every day from each designer’s challenge to make their client’s project unique. Seasoned designers will remember an original design, when others, newer to the industry will be experiencing a trend for the first time. Even color names get updated from the old olive or lime greens to the acid greens used today. Recently a request was made to make decorative frogs for the center of the client’s custom pillow shams. (FROGS? a term from the past!) The designer looked high and low for a suitable Frog. All of the decorative trim suppliers samples resembled a closure on Prince Charming’s vest!.. UGH!! I honestly hadn’t heard that term in a long time and instantly visions of my childhood sewing projects came to mind with these samples. We played around with the design and I was so pleased with the finished Frogs that I wanted to use it here for my new blog!